My little cousin has more potential as an author than I do. How do I know that? Because I put limits on myself. As we grow older our minds and imagination bend and conform to the rules our instinct and reason create. Everything becomes so complicated, even the ideas we have for stories: this idea is too boring, this story won’t sell, etc. But the world isn’t so complex in the eyes of a child. Their main objective is to have fun. Think about the times when you played dress up pretending to be a princess or a spy kid (with the cool shades). When you played with your stuffed animals or dolls pretending you were off on awesome faraway adventures right in the comfort of your own home. Or (my personal favourite) building starships out of LEGO and enacting large scale battles, much to your parents’ annoyance over the thousands of scattered pieces. Children thrive in their imagination when given the opportunity. A while ago, I was away visiting some of my relatives. I was working on a story when my younger cousin came over to see what I was up to. I told her I was writing a story, and she asked, “Can I write one too?” I could tell right there that her mind was racing at a 100 mph. The sheer amount of detail that poured out of her so quickly made it hard for me to keep up. When we had finished, I was amazed by what had just happened. An entire page was filled with a story outline. She had done that in five minutes when it would have taken me ten just to fill half. So why is it harder for us more-grown-up people to generate this kind of creativity flow? We put limits on ourselves. The writing world as we know it isn’t easy. Why? Because there are rules. It begins when we start comparing our work to another’s. We start judging stories based on their content, tone, theme, character, etc. This story doesn’t feel good enough, maybe I should just give up? We get into complexities over things such as: this scene needs to convey more emotion, or this character is too flat. 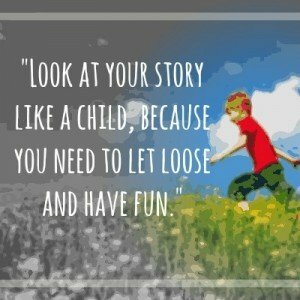 Look at your story like a child because you need to let loose and have fun. Don’t create limits that hold back your imagination. They do not exist in a child because a child is not afraid of limits. Children are the most talented authors in the world.